First things first. So I don’t have refrigeration, shower, or telephone in my new place yet (I figured out how to turn the gas on the stove last night) and what do I do? Return the netbook that was giving me so much grief. It wouldn’t click to open icons, it would cut but not paste, and every time I wanted to open a new page I had to do a CNTL ALT DEL sequence to release the last page. 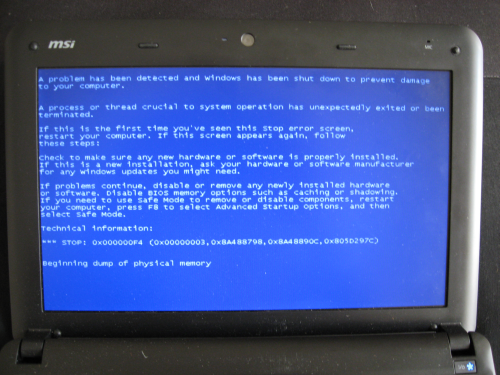 Not to mention not being able to use the spell check editor and seeing the Blue Screen Of Death three times. How did I like the MSI netbook? Not. Okay, it was great for my camping trip. I could pull off the road and catch my email quite effortlessly from the rest stops, which are mostly equipped with WIFI these days, especially on the toll roads. But typing was a problem. Using the left shift key invariably triggered the caps lock above it, and the double quotation mark was positioned above the right shift key in a way to cause a sprain of the bird finger with repeated use. I never was able to enable Arabic (no Service Pack 3) and forget even trying to put on the utilites for my Canon camera and printer. The CD’s are worthless–no internal CD drive. Returning the netbook was simple (thank you, Target). Just a matter of printing out a receipt (okay, I had to go to the library for that, since the netbook was too far gone to print) then returning the defective netbook to my local Target store for a refund to my credit card. Then a quick trip to BestBuy seconds before closing time for the last netbook in the place, a deep blue ten-inch Asus Eee (how do you pronounce that?) with a battery that’s supposed to last seven hours. Already I hate the mousepad, with its bumpy surface that makes the cursor stick, and have plugged in a laser mouse, but the rest of the EEeeee is just fine so far. Now all I have to do is install all my favorite programs on the new netbook. The links to my favorite Firefox addons and Irfanview are here. I enabled Arabic with a few quick clicks–Windows XP Service Pack 3 is already on it. The screen resolution took slightly longer and I had to reboot the system to get all the changes to take effect. Now all I need is the Canon zoombrowser (Zoombrowser EX and the latest update from Canon for my specific camera) (and to resize the 10″ monitor resolution so the file can be unzipped) and my printer utility. And the spyware (Ad-aware and Spybot Search and Destroy) and antivirus (Bitdefender) (AVG) programs (woops, AVG has just added some very intrusive pop-ups that constantly demand you update the program and restart you computer–AVG is now uninstalled). Three years ago the blind guy who took care of the yard and did all the electrical moved out and I started taking care of the property. That means lots of water, grass seed, and Miracle Gro. 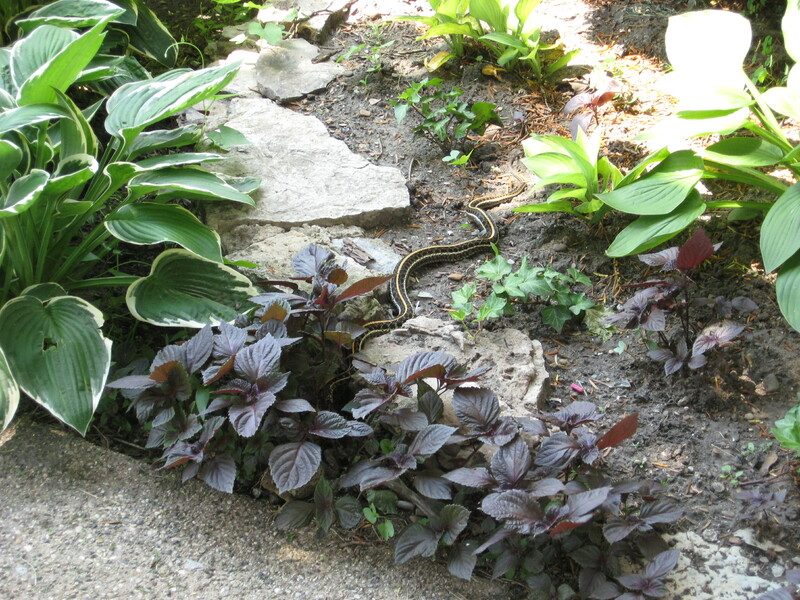 That’s about the time the snake first appeared in the yard, curled up under a flat of freshly watered perennials. 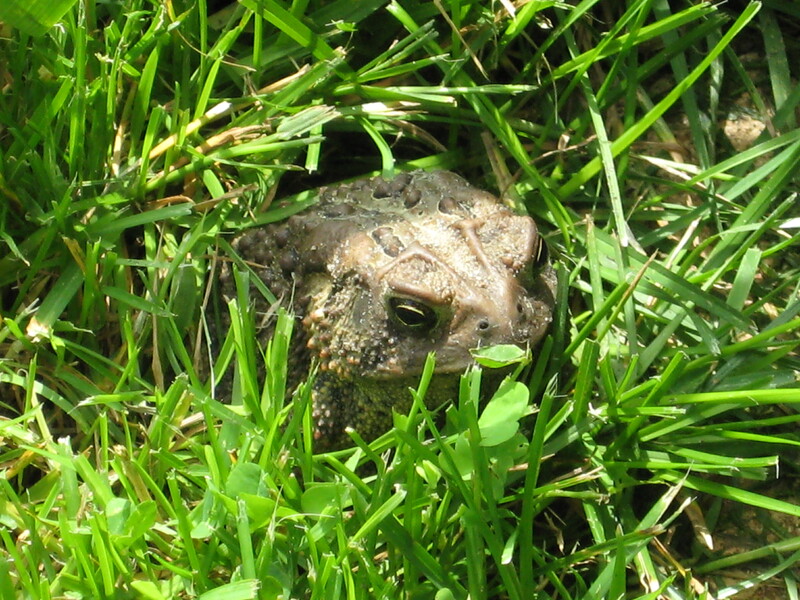 Today when I went to mow the lawn I checked to see if the toad had returned to its spot on lawn. Instead, I saw the disappearing tail of a snake. When I returned with a camera, the snake was nowhere to be found, so I started mowing. 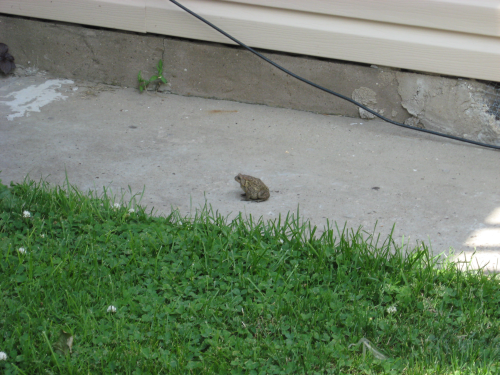 Then the toad appeared, hopping along the sidewalk. 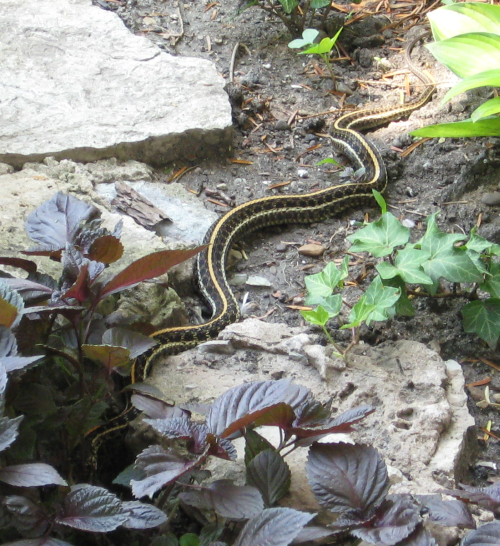 A few moments later the snake, who had disappeared in the back of the yard, reappeared in the front. 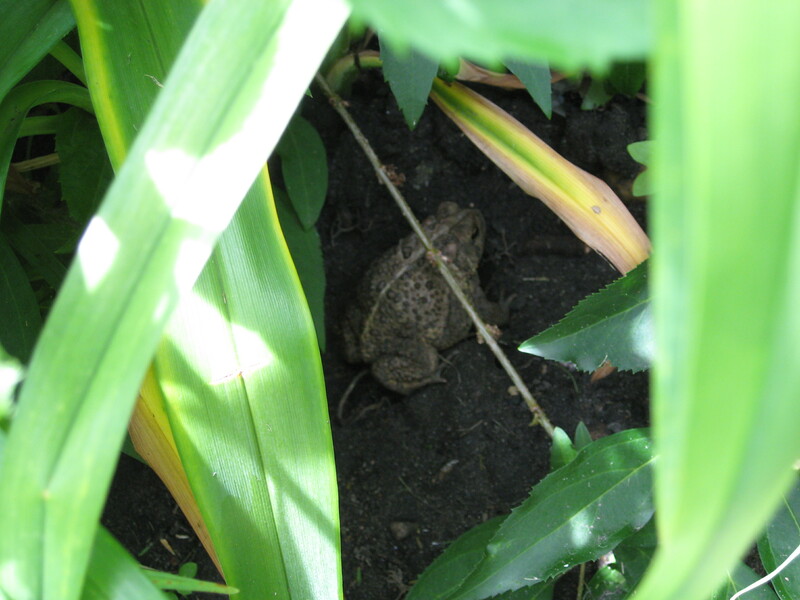 The toad hopped wildly into the hostas, as if pursued by a predator. The snake disappeared again. But where could it have gone? 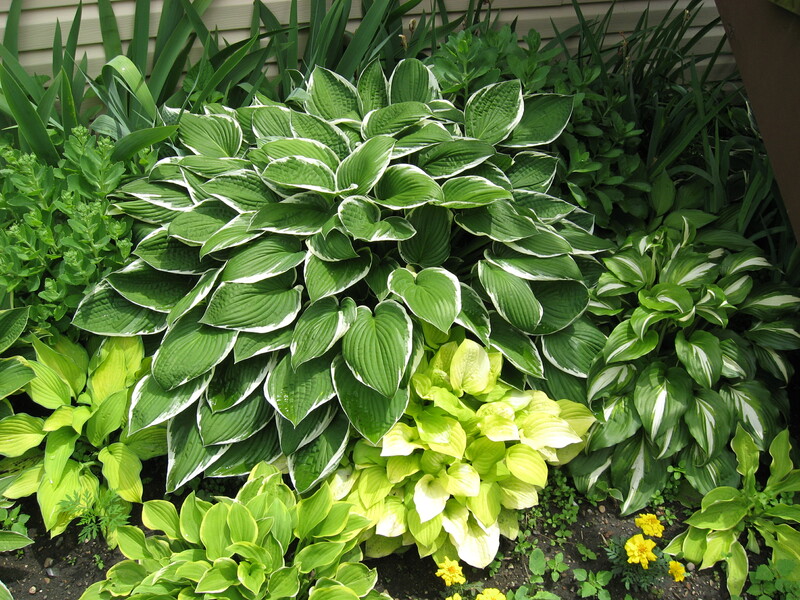 It didn’t cross to the hostas and it didn’t cross the sidewalk. This is one very crafty snake. Today I was reminded of a summer I spent in the Black Hills working at a fast food window. Most of the summer crowd was fast and loud, but not the guy who stood across from my window, who I knew only as “Paha Ska” (pronounced pah HAH skah). In the daytime Paha Ska stood on the sidewalk in full Sioux chieftain’s regalia (he wasn’t really a chief, but he had a special dispensation from the council to wear the outfit.) Once I went with his helper to take the horses from where they had a trail ride concession to a pasture higher in the hills. There is nothing like riding a horse through gently sloping mountain paths with the cool smell of mountain pines in the air. At night Paha Ska painted pictures that were sold in the Indian shop where he always stood. 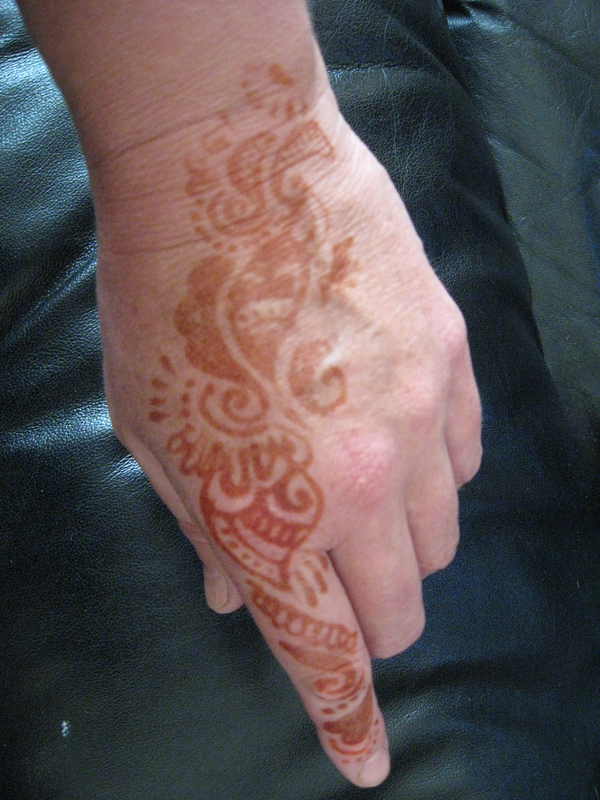 I remember one of a Native American face painted on velvet that someone pointed out to me. 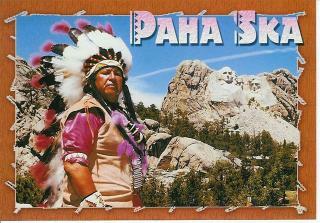 Last summer I passed through the Black Hills for the first time in years, and missed seeing Paha Ska out on the sidewalk. Nothing lasts forever, and I wondered if he was still alive, but no one could tell me anything. But now we have this wonderful thing called the internet and we can find out this type of information with just a few clicks. Sure enough, his obit from a Rapid City paper is reprinted in a geneology website, and now for the first time I know his real name, Orville Francis Salway (October 23, 1923-November 10, 2005). He died at the age of 82. As a child he roamed the hills around Pine Ridge, riding the horses his father bought and sold, hunting and trapping the creeks. He attended the boarding school in Pine Ridge. He was fluent in the Lakota language, taught by his grandmother Millie and mother Winifred, and loved the stories they told of the old days, which found their way into his artwork later. Early on he exhibited a talent for art. His first creations were cartoons drawn on grocery sacks done in pencil. In fourth grade, his teacher submitted one of his drawings of a coyote howling to the Omaha Word-Herald, and its publication birthed a career. 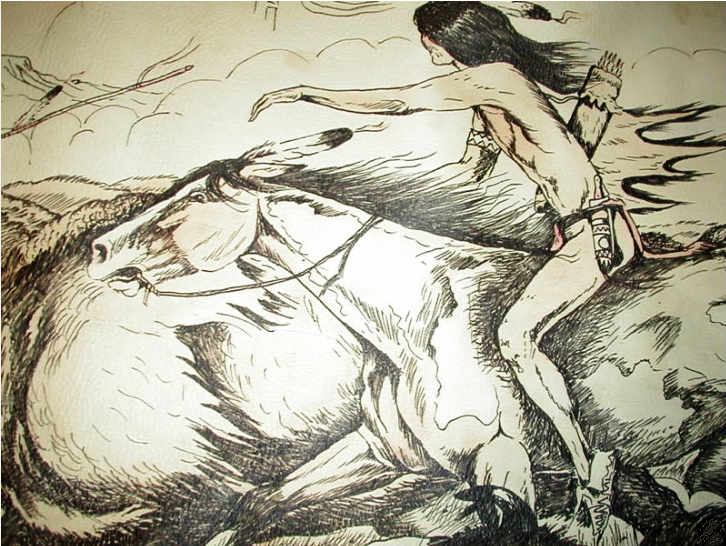 He painted under the name “Paha Ska” (White Hills) after the buttes around the family homestead south of Allen, a name given him by Ben Black Elk. After leaving school he worked on farms and on a buffalo ranch at Camp Crook, South Dakota which supplied meat for the war effort. He also worked in the oil fields in Wyoming and on bridge construction, as a semi-pro boxer, and, with his brother Vincent, as extras in many movies filmed in the Black Hills, such as “White Savage” and “Trials of Chief Pontiac.” He also worked as a pipe layer for the Oscar Jones Construction Co. Rapid City…. 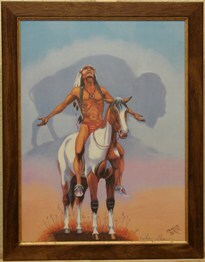 In 1956, after an auto accident, he began working in Keystone selling his artwork to the tourists at the Indians Store. Later he posed for photos in traditional Northern Plains garb with a horse. 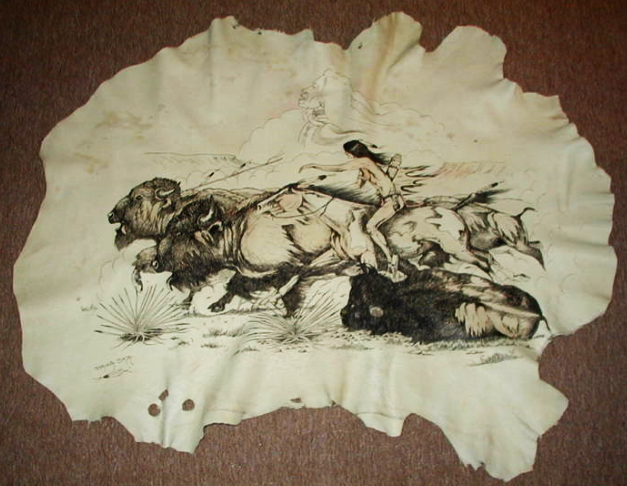 The most famous of these was a bay quarter horse mare named Kippy, who he worked with for 20 years.He continued selling his artwork and ran a trail ride concession. Quiet, sober, humble and soft-spoken, he proudly represented his people as Goodwill Ambassador of Keystone for 48 years, meeting thousands of people, selling over a quarter million prints and hundreds of original oils and hide paintings which are in private collections, museums and even palaces all over the world. Apparently Paha Ska still has a following in the UK. You can see some of his art reproduced here. Paha Ska means “white hills” in Oglala Lakota and may have been the original name for the Badlands, in contrast with paha sapa for the Black Hills. (Our dormitory cat was named “Sapa Weeya” or black lady). Orville Francis Salway was born in a soddy on the Pine Ridge Indian Reservation to William and Winifred Janis Salway. He was educated at the OCS boarding school in Pine Ridge, leaving after 9th grade. He worked in the oil fields, on ranches, in construction, as a boxer traveling in shows, and played in several movies filmed in the Black Hills of South Dakota. All his life he loved two things: horses and art. Demand for his paintings made it possible for him to breed better horses, and his artwork was sold all over the world through art shows and through being an artist in residence at Mt. Rushmore. 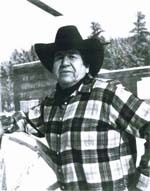 Dressed in traditional garb and eagle feather headdress, Paha Ska (White Hills) as named by Ben Black Elk, was official greeter and goodwill ambassador for the town of Keystone for 48 years. As a side note, I tried to find out more about the “Oglala Lakota language”. I could only find the “Lakota” language, listed in Ethnologue as well as in wikipedia. Somewhere along the line, I heard that the Sioux tribes were divided into Lakota, Dakotah, Huron, Sisseton, Yankton, and Oglala (in South Dakota at least), that some of the tribes don’t necessarily like each other (because of language differences? ), and that they were discouraged very strongly from speaking native languages when they lived at the Indian boarding school at Flandreau, but I never heard what languages they speak. 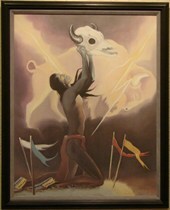 Some of Paha Ska’s work is on exhibit at the Crazy Horse museum in the Black Hills. 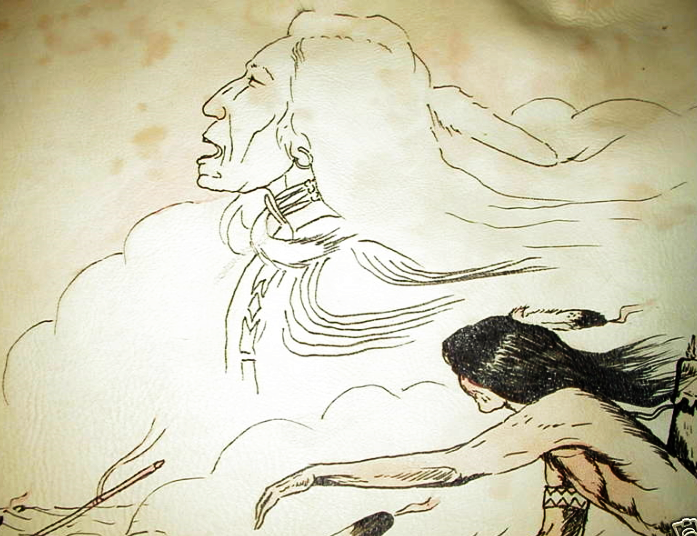 I thought I remembered a tipi painted by him outdoors on a wooden deck, and his daughter confirms in the comments below that a tipi and some of his paintings are now displayed in the museum. 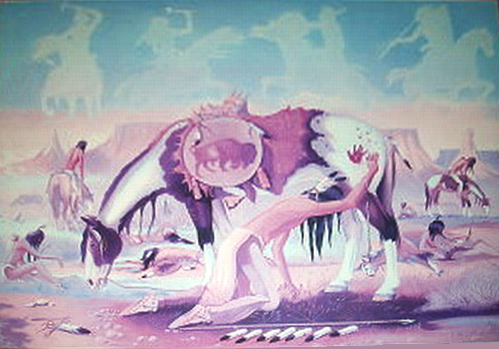 On the Crazy Horse monument’s website, the tipi can be seen on this page, also here. 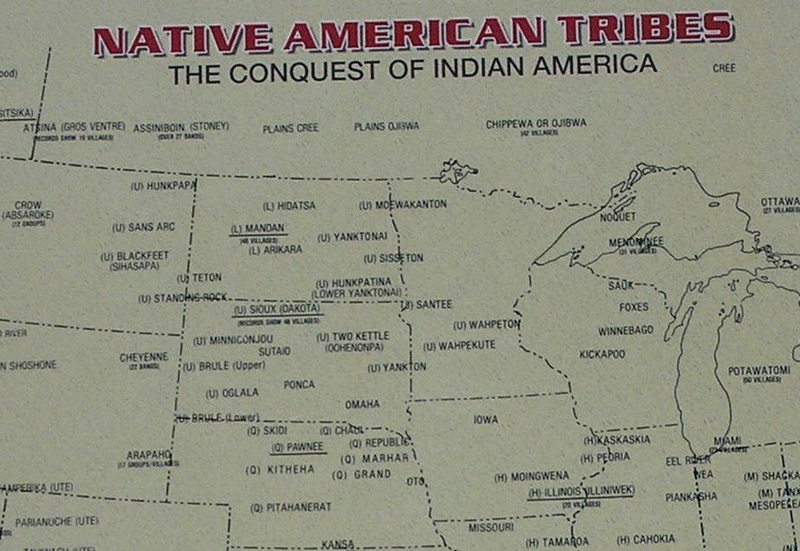 Right, a map of where most tribes are located today (clickable), available from the Crazy Horse gift shop. 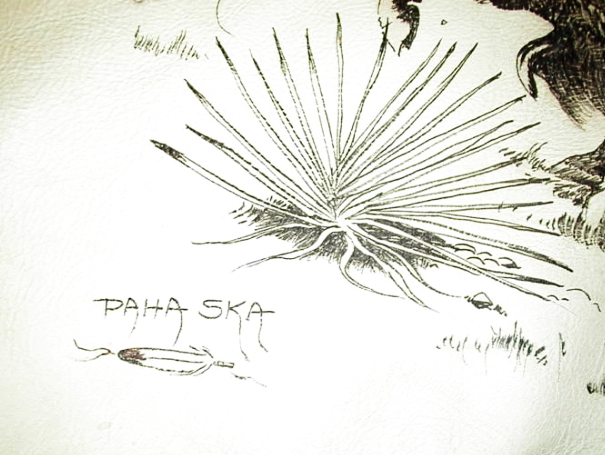 Paha Ska drawing on hide. 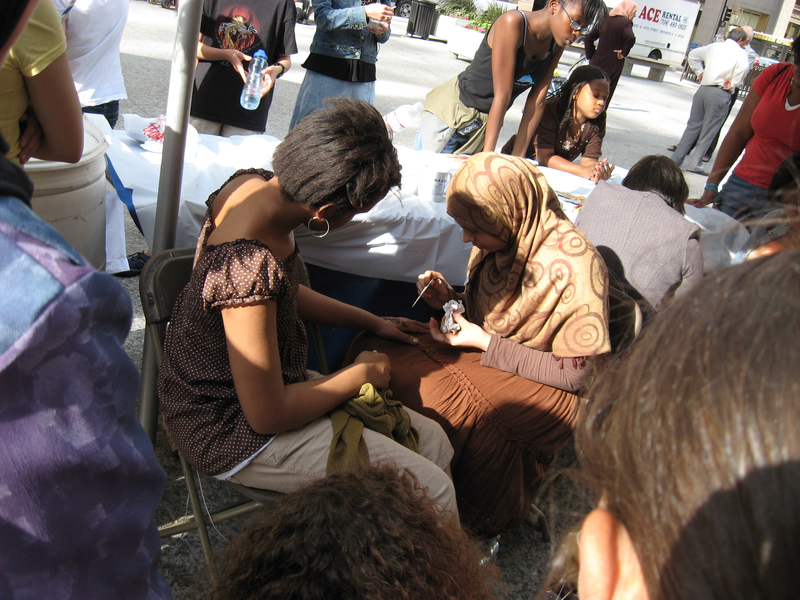 (photo by commenter beastes; thanks beastes and Pam) Images are clickable. This may or not be the same toad that came out yesterday after the rain. 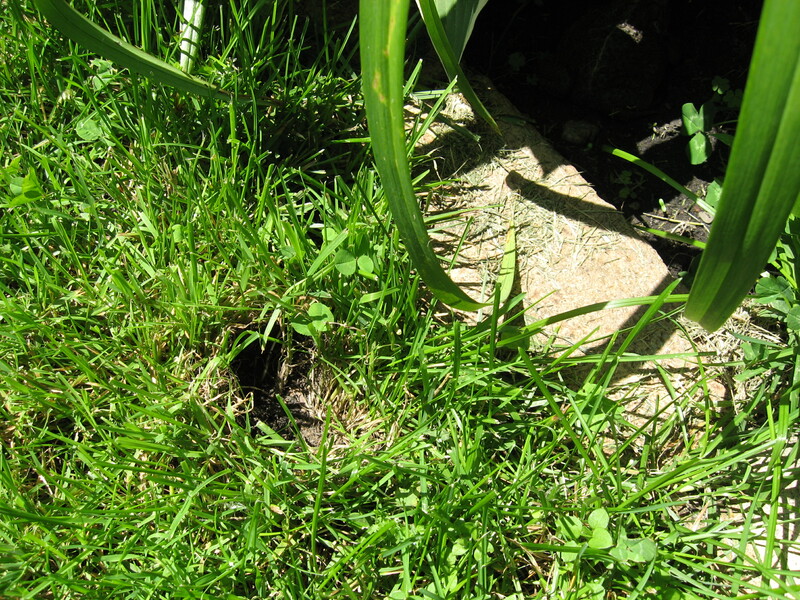 When I turned around for an instant, the toad disappeared, revealing quite a bare spot in the lawn. I walked away for an instant and the toad was back in the same spot again. Would the kids find it there and bother it? 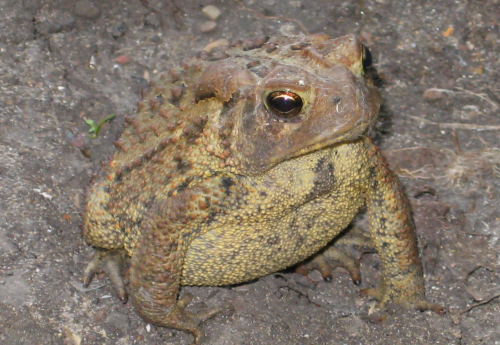 I stood there looking at the toad as it flared its nostrils at me. Finally it hopped off and found a hiding place. Today the toad is gone completely. Hopefully I made it nervous enough for it to survive another summer. 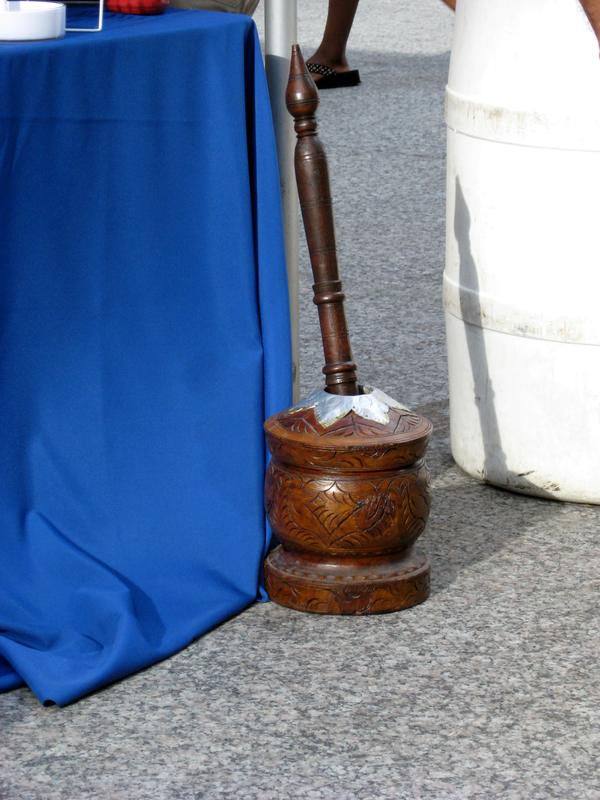 MacBeths’ witches had a toad around their caldron, but I had to look it up. Yup, it’s that time again. 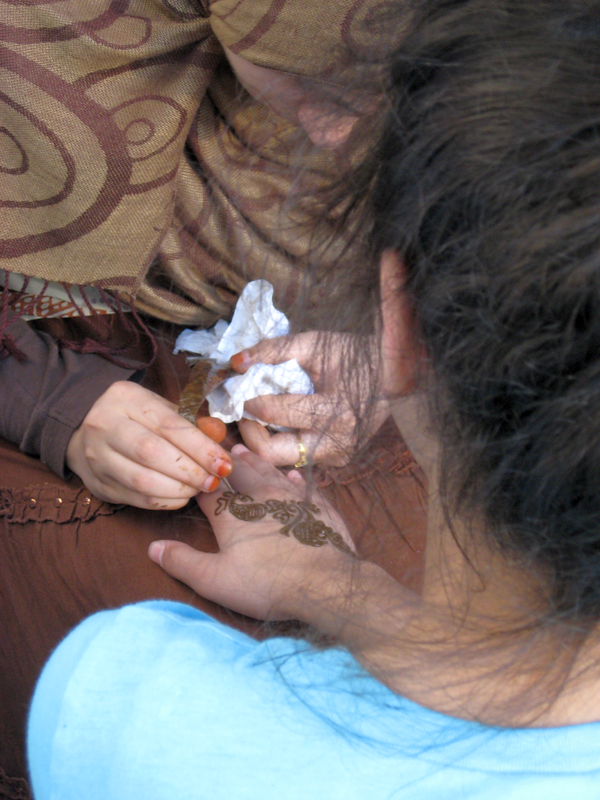 Time for the summer Arab festival. Last year was excellent. 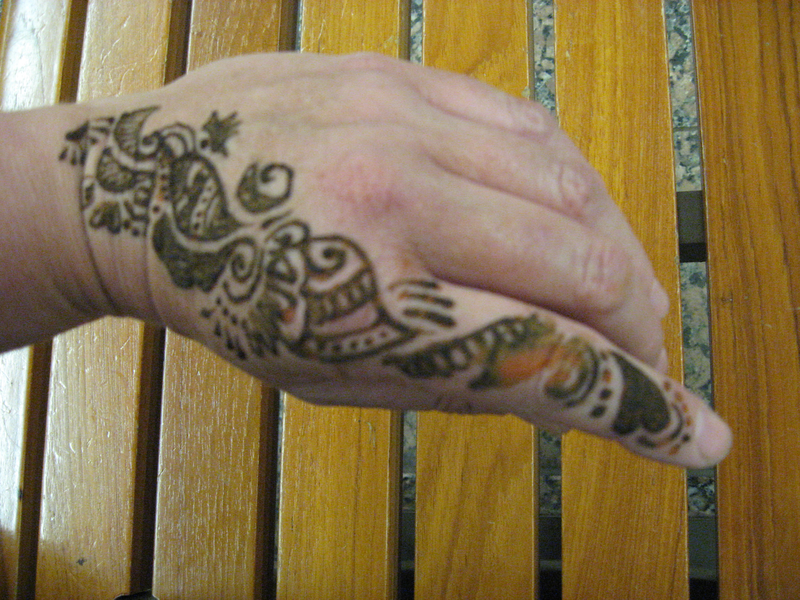 My evil eye pictures are here, and more (clickable) below. 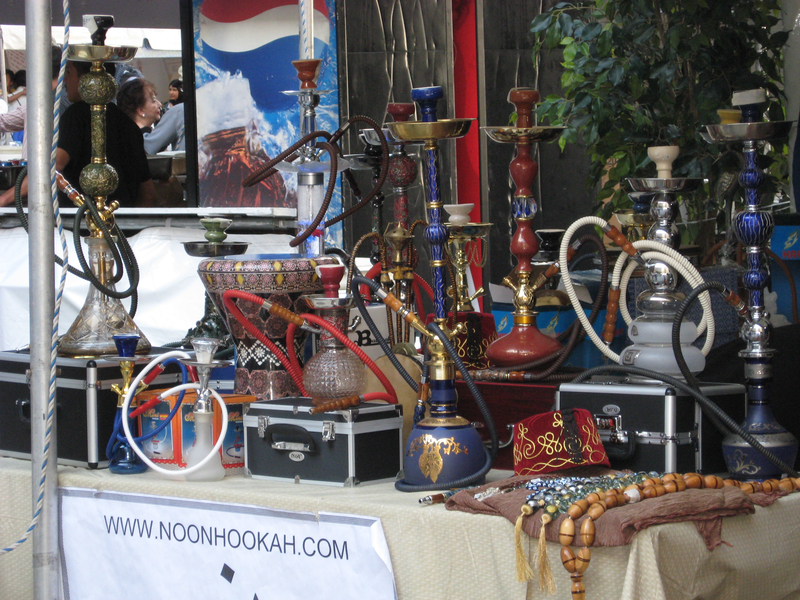 The official website also has a little video montage of last year’s festivities. 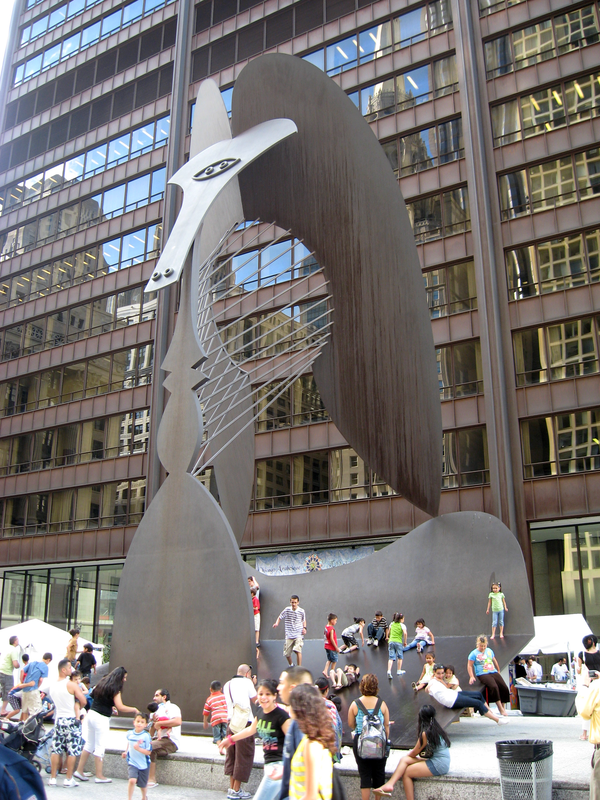 the most central and vibrant part of downtown Chicago. and from 11 A.M. – 7 P.M. on Saturday. This morning I woke up early to the sound of rain, but now the sun has come out. 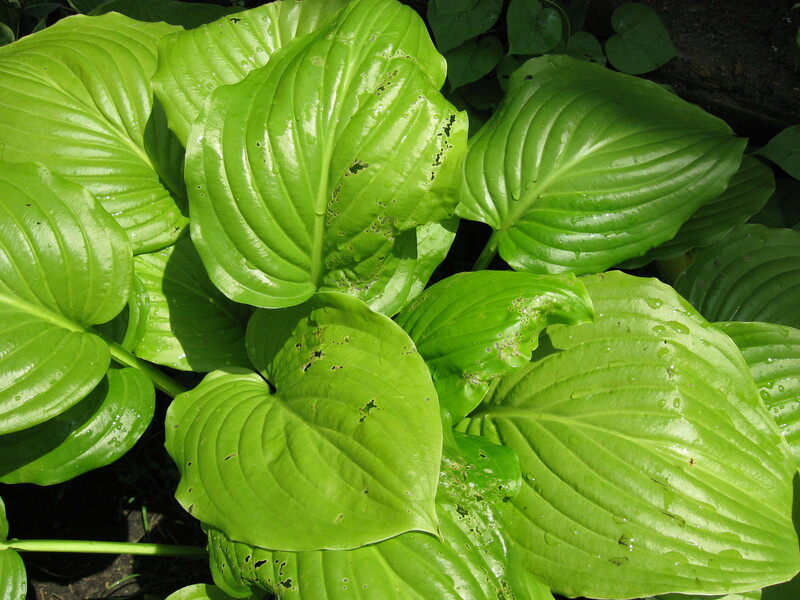 You can already see a little slug damage on some of the hostas. They especially like the light green one. 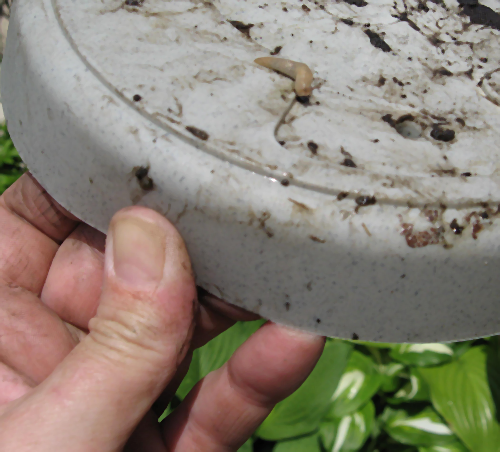 The slugs aren’t very big yet, and I couldn’t find any snails at all. 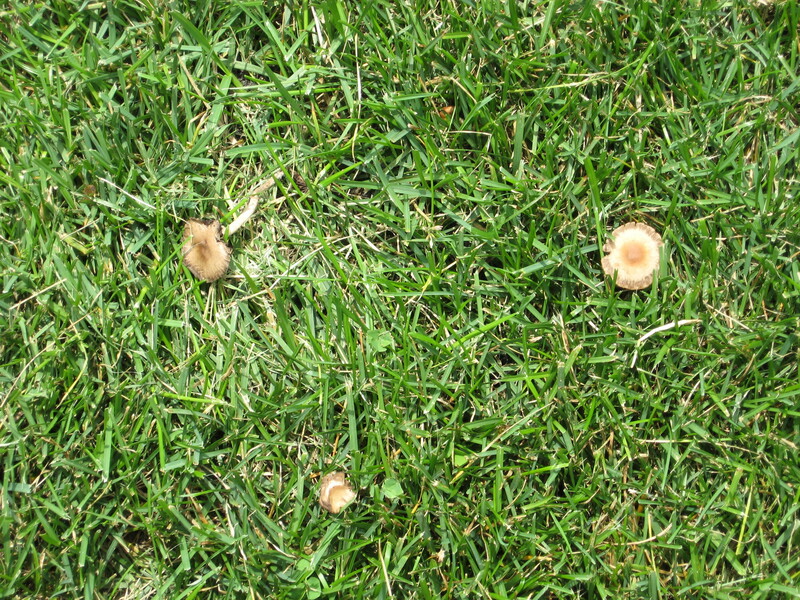 I mowed the lawn yesterday, but there are still some mushrooms left. 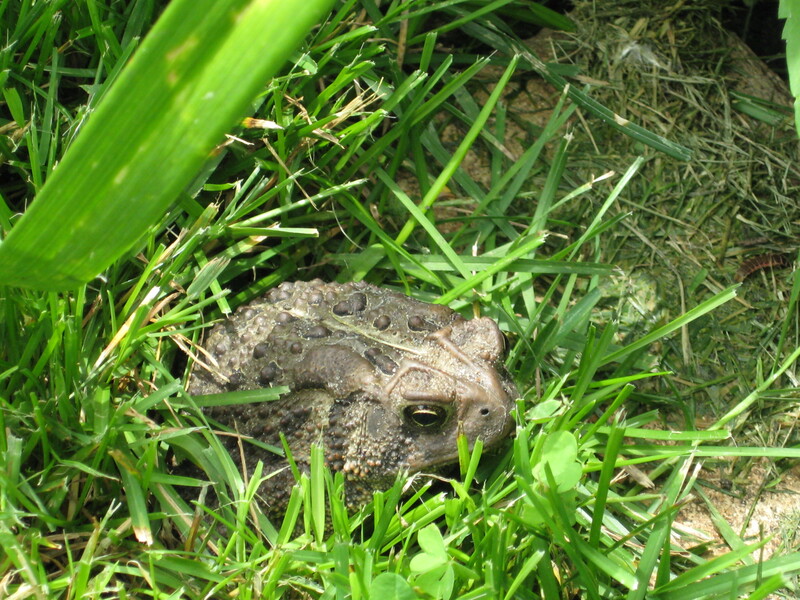 A toad is supposed to be on mosquito duty, but it is sunning itself. It is entirely motionless except for the nostrils which keep expanding. I think it sees me. 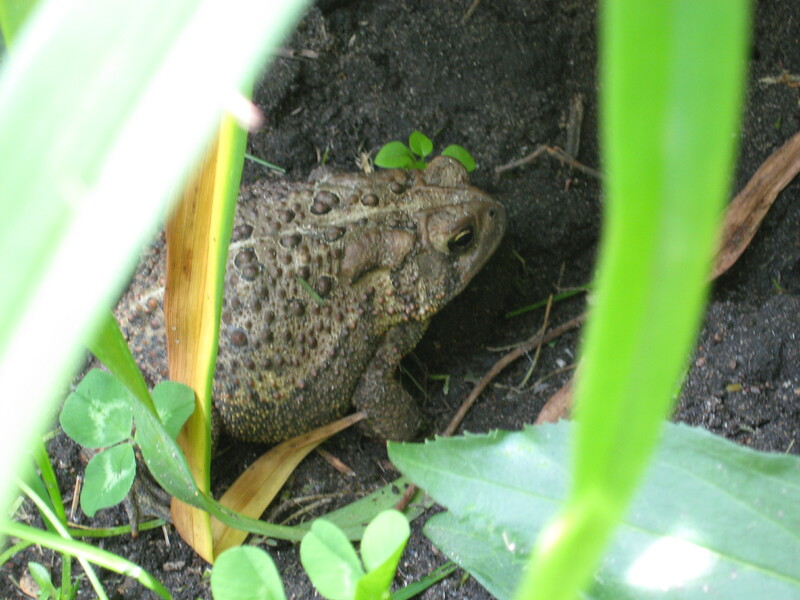 When I turn my back for a moment, the toad avails itself of the opportunity to disappear, and hops into the daylilies. There is a snake around here someplace, but I don’t see it today. 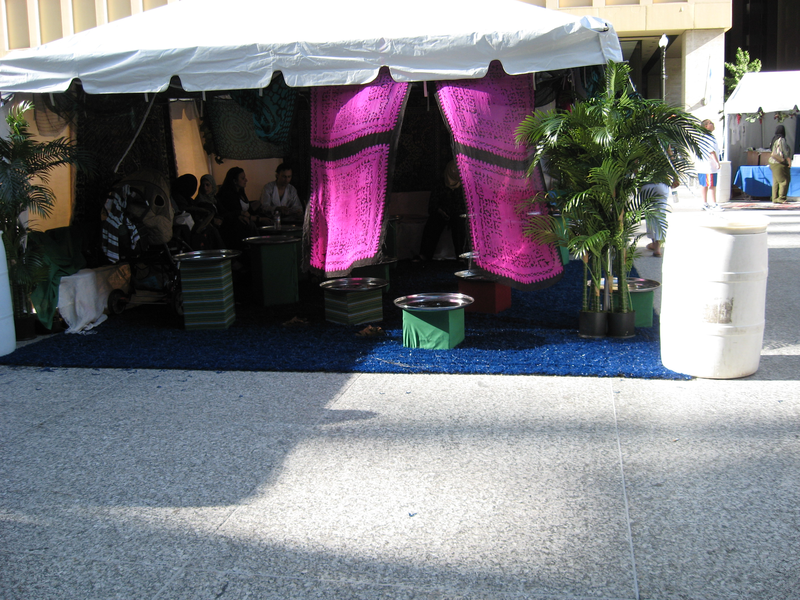 It was last seen disappearing under this foliage.